When you think about holiday marketing, perhaps one or two campaigns stick out to you, but because of the multitude of messages, it’s hard for most people to pick one out from the crowd. Consumer marketers face the challenge of standing out and capturing consumers’ attention with fun, relevant, and personalized campaigns in order to drive revenue. 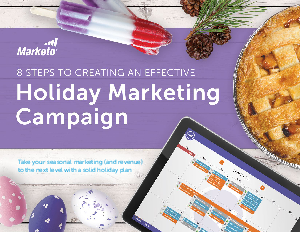 So whether it's for Black Friday or National Ice Cream Sandwich Day, download this guide for eight steps that will show you how to plan, run and measure an effective holiday marketing campaign.